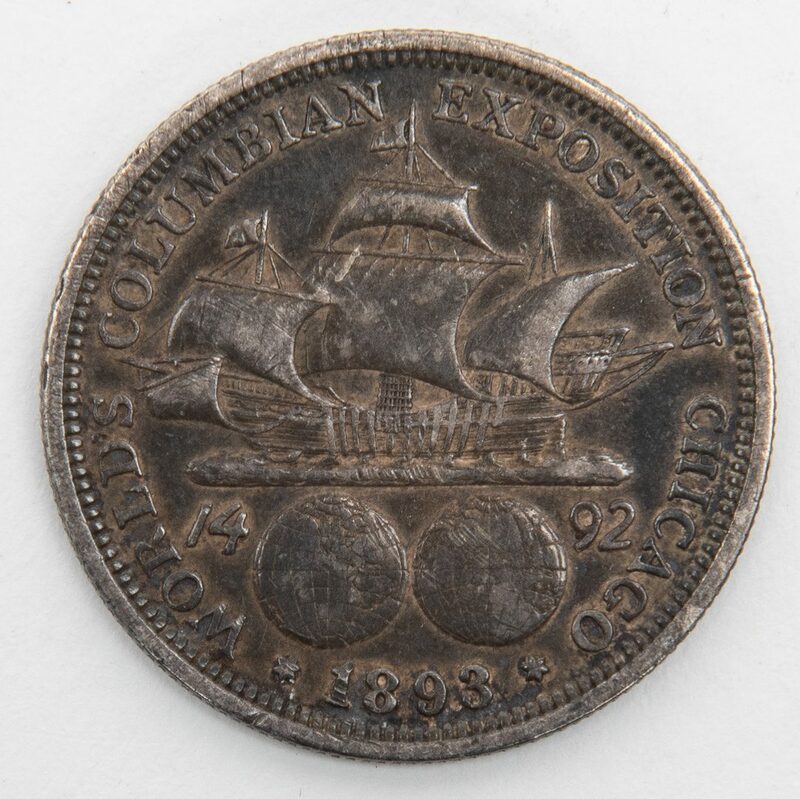 Approximately two thousand four hundred and sixty-nine (2469) US coins, including Morgan Dollars, Franklin Half Dollars, Columbia Exposition, and more. 1st-5th items: Five (5) Morgan Dollars, including one (1) 1879, one (1) 1885, one (1) 1896, one (1) 1921, and one (1) illegible. 4.06 total troy ounces. 6th-29th items: Twenty-four (24) Franklin Half Dollars, one (1) 1954 and twenty-three (23) 1963. 9.66 total troy ounces. 30th-32nd items: One (1) Columbian Exposition Half Dollar and two (2) elongated Columbian Exposition coins, all 1893. .66 total troy ounces. 33rd-61st items: Twenty-nine (29) Kennedy Half Dollars, including nine (9) 1964, seven (7) 1966, seven (7) 1967, four (4) 1968, and two (2) 1969. Approximately 11.04 total troy ounces. 62nd-269th items: Two hundred and eight (208) Jefferson Nickels, minted 1938-1964, including one (1) 1945 "War Nickel". 32.97 total troy ounces. 270th-309th items: Roll of Forty (40) Jefferson Nickels, including two (2) 1948, four (4) 1949, one (1) 1951, three (3) 1952, six (6) 1954, six (6) 1954, one (1) 1955, three (3) 1956, seven (7) 1957, six (6) 1958, and one (1) 1959. Approximately 6.36 total troy ounces. 310th-349th items: Roll of Forty (40) Jefferson Nickels, with six (6) "War Nickels", including one (1) 1938, two (2) 1939, thirteen (13) 1940, six (6) 1941, two (2) 1942, two (2) 1943, two (2) 1945, four (4) 1946, five (5) 1947, and three (3) 1948. Approximately 6.36 total troy ounces. 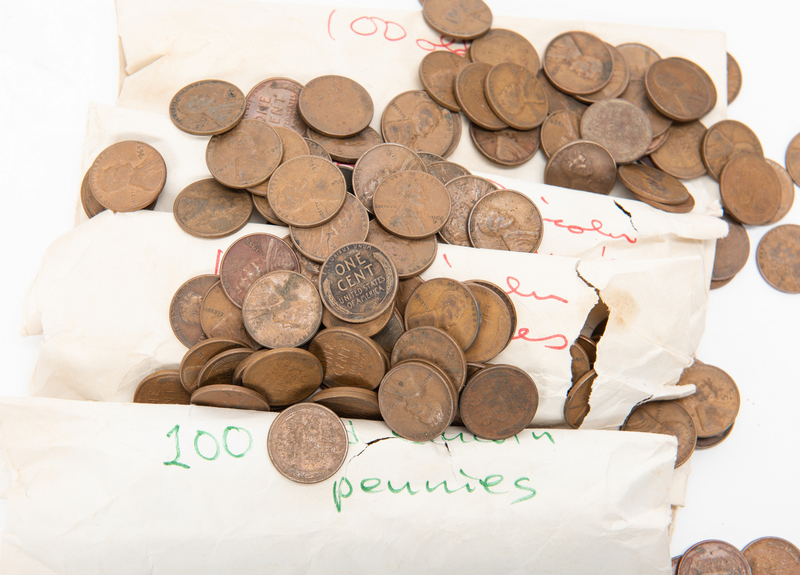 350th-549th items: Approximately two hundred (200) Jefferson Nickels, two (2) rolls labeled "pre 1960". Housed in five (5) rolls. Approximately 31.80 total troy ounces. 550th-584th items: Thirty-five (35) Buffalo Nickels, dates and mints ranging from 1917-D-1938-D. Housed in a blue Whitman Buffalo Nickel Collection 1913 to 1938, No. 9008 folder. Approximately 5.60 total troy ounces. 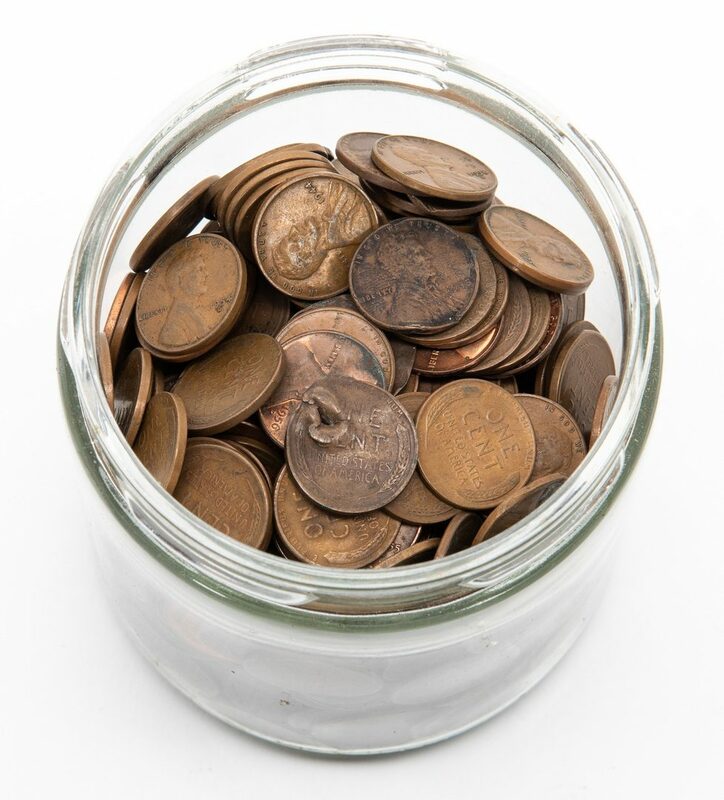 585th-636th items: Fifty-two (52) Lincoln Wheat/Memorial Cents, dates and mints ranging from 1909-1940-S. Housed in a blue Whitman Lincoln Head Cent Collection 1909-1940 Number One, No. 9004 folder. Approximately 4.94 total troy ounces. 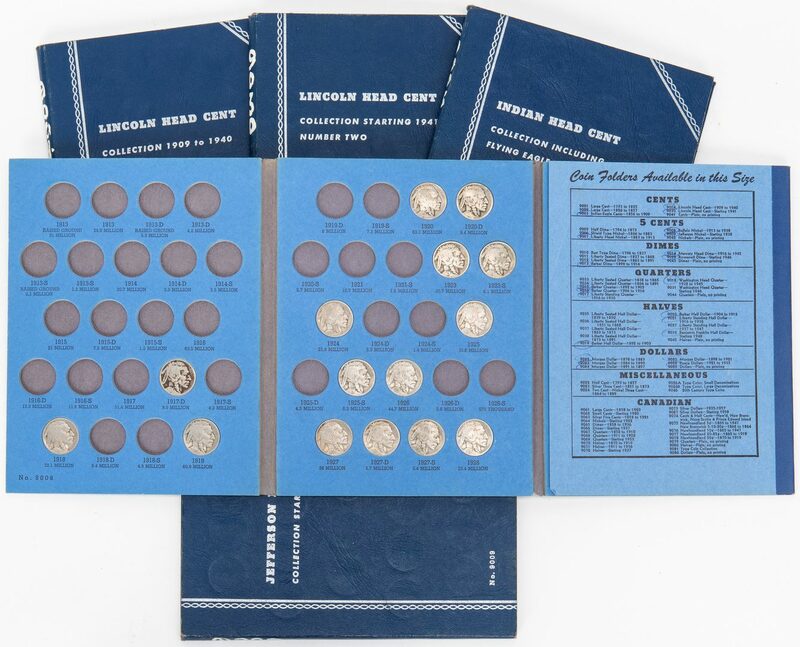 637th-697th items: Sixty-one (61) Lincoln Wheat/Memorial Cents, dates and mints ranging from 1941-1964-D. Housed in a blue Whitman Lincoln Head Cent Collection Starting 1941 Number Two, No. 9030 folder. Approximately 6.10 total troy ounces. 698th-710th items: Thirteen (13) Indian Head Cents, dates ranging from 1864-1906. 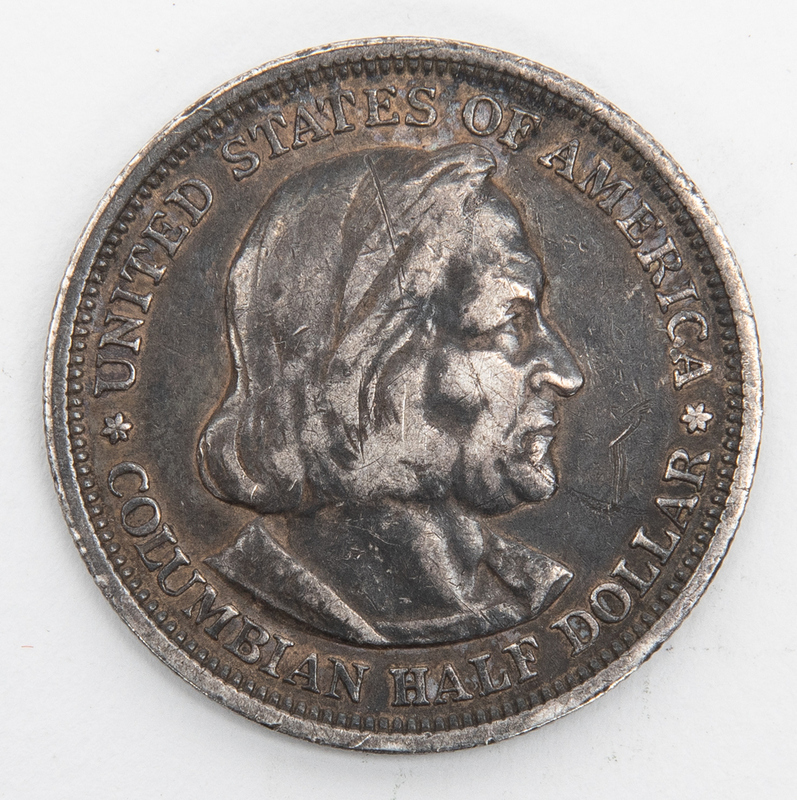 Housed in a blue Whitman Indian Head Cent Collection Including 1856 to 1909, No. 9003 folder. Approximately 1.17 total troy ounces. 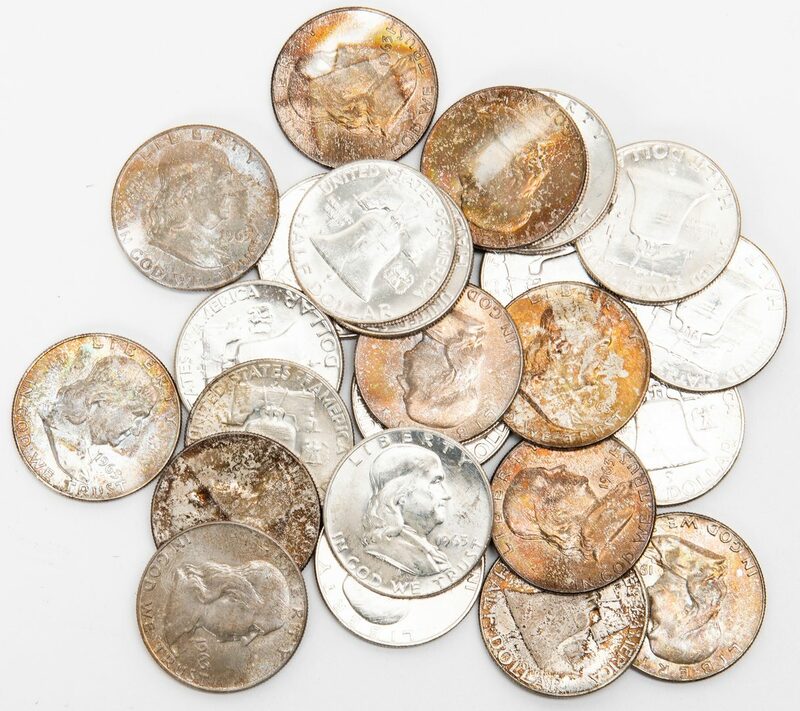 711th-769th items: Fifty-nine (59) Jefferson Nickels, dates and mints ranging from 1938-1961-D. Housed in a blue Whitman Jefferson Nickel Collection Starting 1938, No. 9009 folder. Approximately 9.44 total troy ounces. 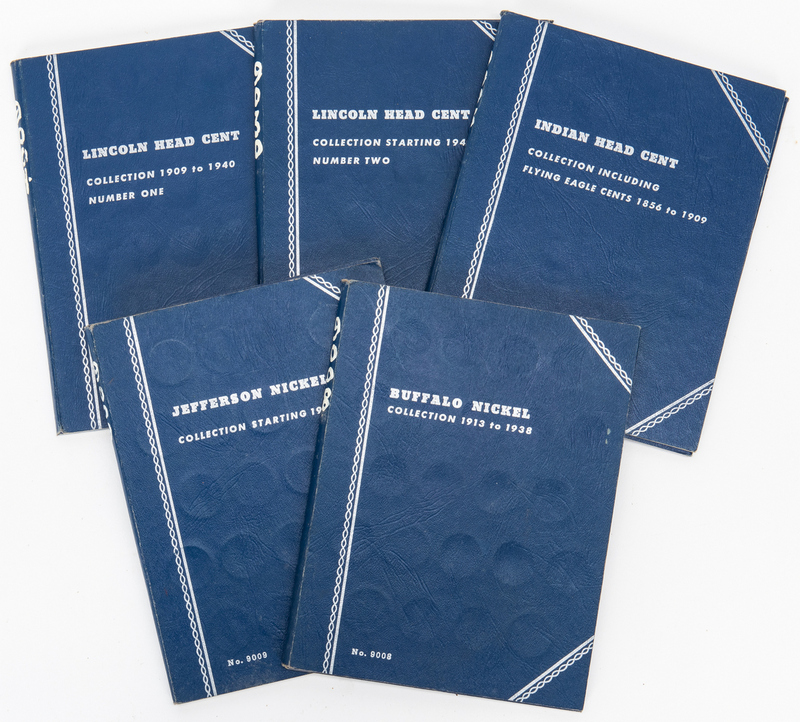 Folders approximately 7 5/8" H x 6" W x 1/4" D. 770th-1210th items: Four hundred and forty-one (441) Lincoln Wheat Cents, dates and mints ranging from 1912-1958-D, including twenty-two (22) steel 1943 cents. Approximately 43.82 total troy ounces. 1211th-1460th items: Approximately two hundred and fifty (250) steel 1943 Lincoln Wheat Cents, from various mints. Housed in five (5) rolls. Approximately 22.50 total troy ounces. 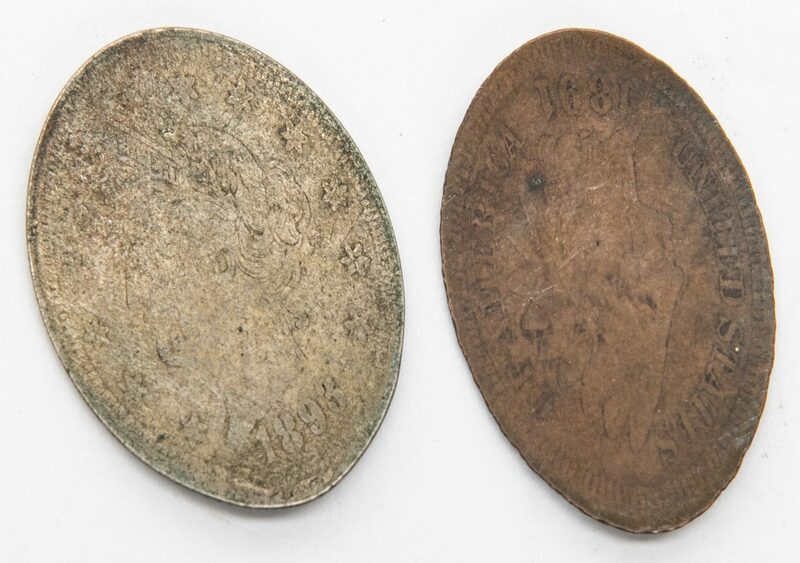 1461st-1760th items: Approximately three hundred (300) Lincoln Wheat Cents, minted 1909-1956. Housed in six (6) rolls. Approximately 28.50 total troy ounces. 1761st-1960th items: Approximately two hundred (200) Lincoln Memorial Cents, minted post 1959. Housed in four (4) rolls. Approximately 20 total troy ounces. 1961st-1460th items: Approximately five hundred (500) Lincoln Wheat Cents, minted 1909-1956. Housed in five (5) envelopes. Approximately 50 total troy ounces. 2461st-2469th items: One (1) Brown faux letter bag and eight (8) tins and glass jars, 9 items total. Ranging in size from 2 5/8" H x 10 3/4" H. Approximately 294.98 total troy ounces for all coins. Provenance: the collection of Benjamin Dysart, Brentwood, Tennessee. CONDITION: All coins in circulated condition. 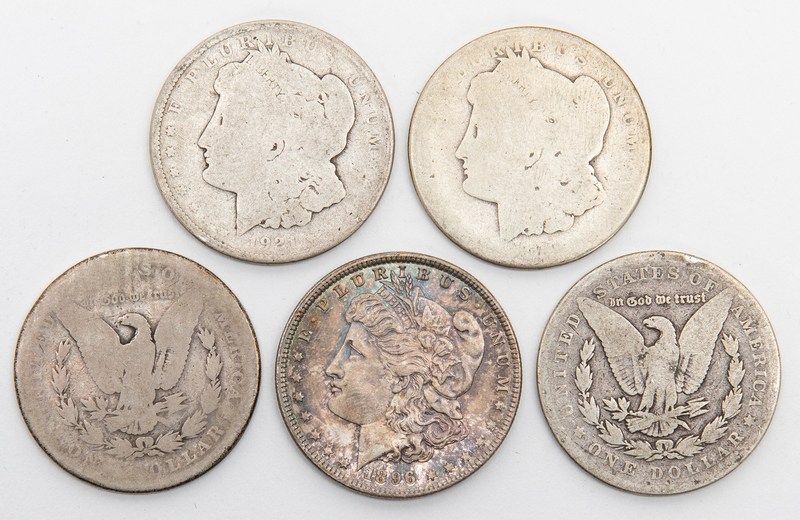 550th-769th items: Coins in circulated condition. Folders are not completely filled. Does not include all coins within the described parameters. Folders in worn condition. 1961st-2460th items: Two (2) of the envelopes are torn, all associated coins have been kept together.